What to feed your horse? Deciding what to feed your horse is a really important decision, it affects their health, their performance and their mindset. As a rider/owner it is a minefield popping into your local tackshop or feed store for a bag of food for your horse. There is so much choice, bright coloured bags and lots of clever promises across the products. 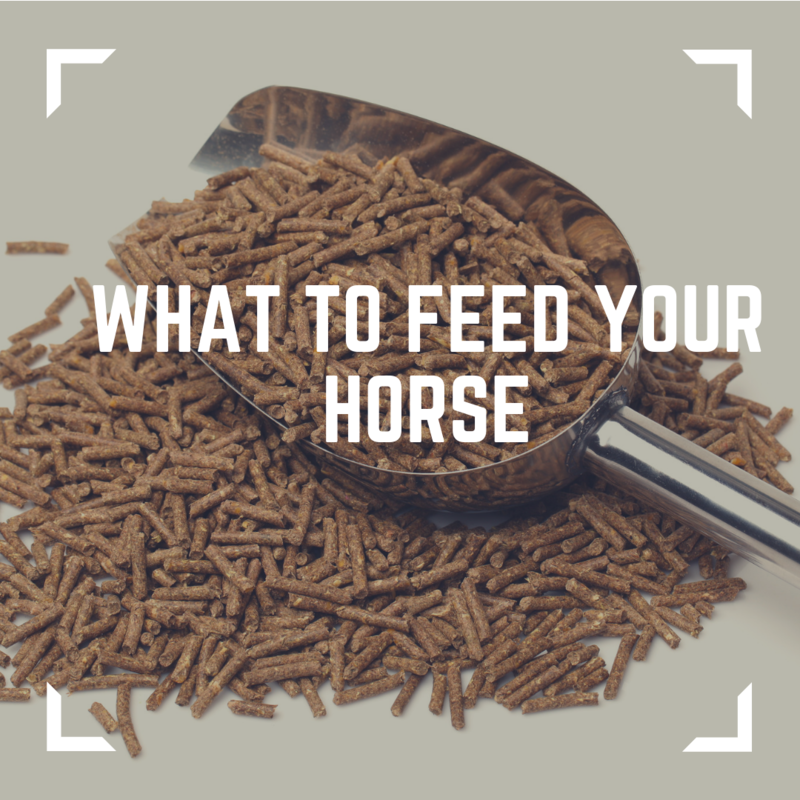 You might have others at your yard suggesting that you feed your horse this or that, and how it’s worked wonders for their dressage horse, eventer or trec superstar. Are they getting enough energy? A horse will either be overweight (receiving too many calories), underweight (not enough) or an ideal weight.It is important to note that most owners underestimate fat covering on their own horse. Are they receiving the necessary vitamins and minerals? This is harder as a mineral or vitamin deficiency will take much longer to see, and could present as poor coat or hoof quality. Workload - how much work does your horse actually do? The modern leisure horse does a lot less work than it’s counterpart did twenty or thirty years ago. More and more people have transport so hacking to shows or lessons (as I did) is relatively unheard of. Riders probably go on shorter hacks due to busier roads, less bridleway access and often less time. A horse’s workload was typically classified as ‘light’ (schooling and hacking most days), ‘medium work’ (competing in dressage and showjumping regularly) or ‘hard work’ (higher level eventing, regular hunting or endurance). If you look on many bags of horse feed they will labelled as appropriate for low or medium (or high) energy requirements but many owners are overestimating the work level of their horse. Twenty minutes of schooling a few times a week, a gentle hack and maybe the odd lunge are not medium work. It is well documented that horses are not only living longer, but that they are aging better, a horse into it’s twenties can still be enjoying an active life with correct management. The age of your horse will also determine the amount of energy that it requires to remain healthy, with older and growing youngstock having greater nutritional requirements. Do you know how much your horse actually weighs? Are you feeding for the current weight or the weight your horse needs to be? Bobby is a cob type, he is 8 years old, is around 15hh and weighs 600kg with a body condition score of 7 (he is overweight). He is ridden 4 times a week, and puts in as little effort into schooling as he can get away with- he rarely breaks into a sweat. His owner is trying to get him to 500kg. So 2% of his BW = 10kg. He will receive 9.5kg hay when stabled (4pm until 8am) and 500g of a balancer to meet his nutritional requirements of vitamins and minerals. His ration is sensibly made up of forage as he has low energy requirements, weighed to control intake and could be soaked to reduce the calories in the hay. It might sound a bit strange to choose feed for a horse based on the rider but actually this is a very good point. It is essential to select a food that provides appropriate energy levels and suitable energy sources for the work that your horse is doing, otherwise your horse will gain weight. Selecting the wrong energy sources for your horse can also result in a rather lively four legged partner, and rider’s level of skill, confidence and ability should be considered as well as what the horse really needs. Horses in the wild experience seasonal weight loss and weight gain in accordance with the availability of food and climatic conditions. This actually keeps them healthy reports of laminitis are very rare among ‘managed’ Native ponies living on moors or forests. Nowadays owners go to great length to avoid ANY weight loss during the winter, and often this is a mistake. If you own a ‘good doer’ it can be tough keeping them slim during the Spring and Summer months, but letting them lose some weight in the colder months will be very beneficial for your horse. They will start the following Spring the correct weight, not 100kg too heavy, and if you encourage this to happen each year it will certainly keep your horse healthier. Does your horse live inside all winter, wrapped up in twenty rugs or is he out in all weathers? Naturally this is going to impact on how much energy he requires. If your horse is overweight gets some rugs off, or consider him living out to help you manage his weight, seasonal weight loss can be really helpful. So if you are wondering what to feed your horse start by thinking about what your horse needs, if he or she is overweight and what feed will promote good digestive health. The vast majority of leisure horses require a fibre diet only, and a balancer is helpful to ensure their vitamin and mineral requirements are met. It is all too easy to be swayed by marketing claims and clever advertising when choosing a horse feed, so start with the basics. I hope you have found this post helpful, do get in touch with any questions that you might have about feeding your horse. If you would like to learn more about nutrition you can register for information on our new online nutrition course here.